Researchers from Germany, Russia and the USA managed to increase graphene's conduction electrons' spin-orbit coupling by a factor of 10,000. They say this could enable a Spintronics switch that is controlled by a small electric field. 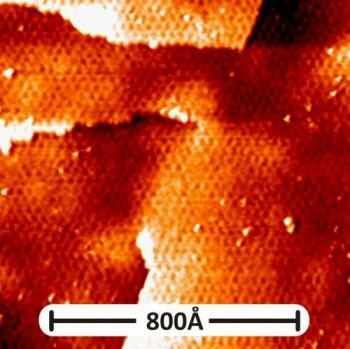 To develop this, the researchers placed graphene on a nickel substrate in which atoms are separated by the same distance as the graphene's hexagonal meshes. They then deposited gold atoms on the device which ended up between the graphene and nickel sheets. The electrons in the graphene layer exhibited an increased spin-orbit coupling - in fact 10,000 stronger compared to a regular graphene sheet. They say that such a strong spin-orbit coupling could be used to develop a Spintronics switch - in which the spin can be rotated using an electric field. The switch will include two perpendicular spin filters that will be controlled by the electric field.